The Salvation Army operates camps across the country, providing children with the opportunity to experience the outdoors, make friends, and learn new skills. For low-income parents, summer camps help reduce the burden of child care when children are out of school. 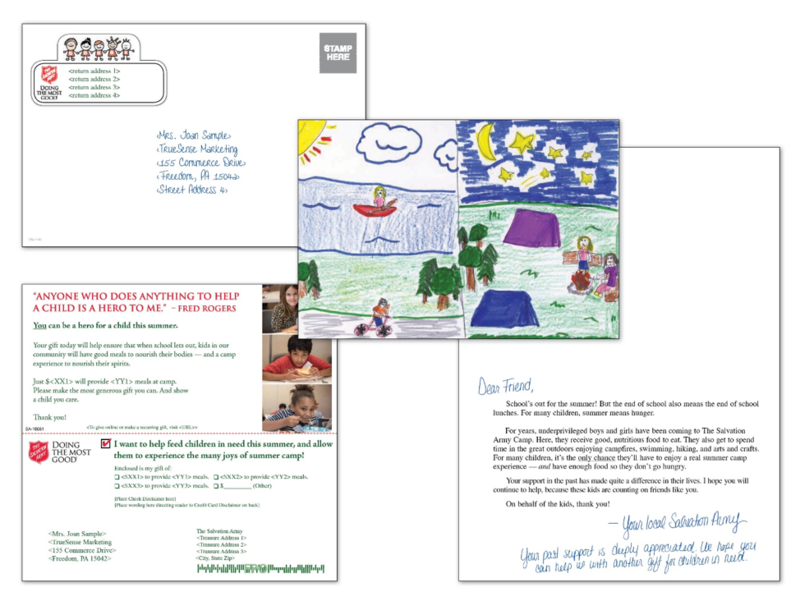 Camp has been a traditional fundraising effort of The Salvation Army for decades, but the response to camp-specific mailings has declined. In the last five years, many camp appeals have been replaced with other fundraising appeal packages. These new, more effective controls have outperformed camp packages in head-to-head tests. Our strategy at TrueSense has been to continue mailing camp appeals to previous camp-appeal donors, while sending the new control packages to the rest of the donor file. We essentially formed an affinity donor group that loves camp! In a representative Division, the response rate for FY18 by the camp affinity group was four times higher, and average gifts were 10 percent larger than the control audience. One significant problem remains: How do you find new donors to add to the camp affinity group so it doesn’t vanish over time as donors either lapse or are no longer active? In FY20, the new donors who gave to the camp package will join the camp affinity group, and the rest will cycle into the current non-camp control. A similar approach could be utilized for other specific selects to identify affinity by existing donors. This strategy sacrifices a small performance difference with new donors in the first year to strengthen overall performance over time by maintaining and developing a strong affinity audience that lifts overall campaign performance by 15 percent.